I want to love you, P.Y.T., Pretty Young Thing...OR Remember the time? 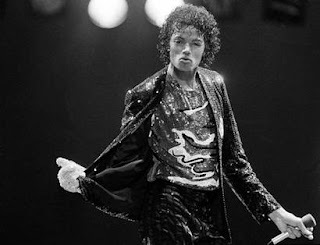 Seeing the news of Michael Jackson's death is so unexpected. Watching the coverage, I just get more and more sentimental and sad. I will never forget the day that we woke up to the news that MJ's hair had caught on fire as he filmed a Pepsi commercial. We were driving to Mississippi to visit some of my parents' friends and it came on the radio. Plus Dinky got the Thriller LP for Christmas the year it came out and we spent hours looking at the big fold out picture of Michael holding the tiger cub. We were caught up in how bizarre his wrist looked. If you lived it then you know what I mean because it was impossible not to notice how his wrist had two tendons or veins or something that popped out really far. When I heard "We are the World" tonight, I thought about a night in 1983-ish when I stood out in the yard at dusk and processed the fact that if Michael Jackson might happen gaze at the moon right then, we would be looking at the the same thing at the same time. It was a pathetic! I was a huge fan. We bought the teeny bopper magazines to read all about him and we watched The Wiz when it came on tv. We had a 2 story playhouse with a balcony. We would pull the trampoline over beneath the balcony, turn on the little tape deck of songs, including MJ's biggest hits, recorded from the radio and perform a concert and then do trick-like flips off the balcony. My dad would drag the trampoline away but then we'd get some friends together and bring it right back across the yard while he was at work. One time Dinky landed on the springs on her back but otherwise no one ever got seriously injured. He finally gave up. P.S. Our playhouse had a working bathroom upstairs. We sat stunned when the video for Bad debuted and he was so light and barely had a nose compared to his natural, original features. We followed his career and wondered what in the world had happened to him but we never quit loving his music. His moves still look the smoothest. 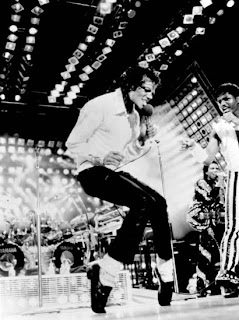 I will always remember Michael Jackson fondly. May his glove always sparkle more than any disco ball. I always held out hope that I would see him in person. Do you ever have morbid thoughts about yourself now that you're a mom? I know I do. Not morbid thoughts in the sense of graphic info, but morbid thoughts like how you'd like to be remembered should something tragic happen to you? As bizarre as it might sound to some people, I really think those thoughts are necessary when I have two little girls who would be left in this world without me. I do know that I would want to be cremated, and that I would want certain music played at my services. I am a funny person, and I would automatically want some music to crack people up. I would want some Elvis singing southern gospel music mixed with some baptist hymns that were my favorites growing up, like Victory in Jesus, Because He Lives, Old Rugged Cross and so on played. I can't forget to include The Brown's 'Three Bells'. (All the chapel bells were ringing...) That last one if from the 50's or 60's if you don't recall it. The hymns are important to me because those were my favorite church songs at Pine Grove when I was little. The Elvis is because I think people that know me would immediately realize that I picked those to be hilarious. Seriously, in this day and age, doesn't it crack you up to hear Elvis sing Amazing Grace?!?! It would be flamboyant, just like me! I wonder if other people think the same way I do? Furthermore, I would hope that my husband found love again...and as crazy as this sounds, I would like for it to be with one of my friends! Yes! I said one of my friends. Why, you might ask? Well, because any friend would not come in and try to replace me. She would also value my children more than a stranger would as a step-mom. Plus, I know my friends. I choose my friends wisely. I do not choose fake, childish people as my true friends. I am well aware that I might get some comments telling me that I've lost my mind, but just think about it. The more you consider it, the more sense it makes. I would want my girls to know just how much they fulfilled my life, and for Phillip to know just how much I respect him. He works so hard for our family. I am able to stay at home and take care of Miles and Lola because he gets up everyday and commutes to Nashville. Nothing has ever made me happier than to see a smile on my girls' faces or to hear how much they look up to me. They fulfill me in every way. Though I might complain sometimes, I would never, ever trust a stranger to take care of them as well as I do. I would want my girls to grow up to be Chi Omegas and Junior League members, since both of these organizations mean so much to me. The truth is, I make a difference in our community, even if I am normally humble about mentioning it. I volunteer for my community on a regular basis! I would like to see them each marry a Sigma Chi or a Kappa Alpha. Silly, but it is just a part of me. I would want my girls to group up under the wings of Miss Mandy Cany Kelly, Missi and Julie and Leigh Ann, who could share old stories about me as they grow up. I would want them to look for a husband like their daddy or Brent Campbell or John Trail. Don't be alarmed; I plan to live a long, happy life! I don't mean to sound like I expect to meet my maker any time soon. I just think that these subjects are important and I'm not a shy person. I don't mind sharing my strange thoughts; I just hope you all understand where I'm coming from as a momma. How Miles was injured OR Broken bones are cool to kids! So much has happened in the past week. I haven't even thought about blogging about it all yet, but here I am tonight. On Monday evening, the girls got restless around 4. Since Phillip wouldn't be home until 6, I decided to head over to the park with them. After all, we literally live within blocks of a fantastic block and my girls are at an age where I can watch them play without having to actually be on the equipment making sure that they don't fall and hurt themselves, right? Ha! Yeah, right! We got there and set our things down and before anytime at all, Miles had befriended two little boys. They began to run wild on the playground and the grassy area just behind it. As the little group of new found friends ran back to the play area, Lola lagged behind. I yelled out to Miles to wait for Sissy. Then, in slow motion, I saw the whole thing. She continued to run but looked over her left shoulder to check on Lo. Just as she looked forward again, she began to tumble. Feet left the ground, and her little body catapulted forward, coming down first on her right elbow and then on top of her forearm. She immediately started screaming in a piercing way. The boys' father asked if she was ok from across the playground, and I yelled back that I was about to find out and smiled. When I got to her, she was screaming bloody murder that she needed to get home. Now any parent knows that a child asking to leave the playground must really be hurt. Her arm bent back and forth just fine, but I wondered if it might be really injured. That night, she woke up crying in pain and it was far more swollen. I almost took her to the ER, but she calmed down and went to sleep. First thing Tuesday a.m., we made an appointment to see her pediatrician. Sure enough, her arm is broken! Even the smallest air cast, size xxs, was too big for her sweet little arm, so we have a partial cast and a fancy ace-type bandage over that. She's hanging in there better than most adults, and hopefully, she will be done with this completely in less than three weeks. Please pray for my Milesy girl. This is her first real injury in life. I am just so tickled to report that this morning, when the preacher asked for volunteers to provide food for VBS, without any prompting or discussion, Miles hurriedly raised her hand high into the air to bring sandwiches!!! How sweet is that?! Thus far, we've spent our summer days roaming around the zoo, splashing at a water park, going to the neighborhood playground, exploring and creating at the Discovery Center, visiting Mrs. Mandy and Mr. Neil's to sit around a campfire and look at the stars and going to the library. We managed to get out of the house more regularly and the kids are exhausted by bedtime! Yes! We've tried to catch fireflies and we've had a picnic underneath a big shade tree on the lush green grass. We've had Push Ups and fresh watermelon. We've picked flowers and investigated butterflies. This summer in the city is turning out quite well. We're in the process of sorting through our clothes for Goodwill and decluttering as much as possible. Hopefully, we'll be able to sell our house soon and figure out where we go from here. I am not worried about it all. We just want a place with a bigger yard. I am not sure if we'll rent or buy. We are not even remotely interested in buying a place on the same day we sell this place, as we got burned by that three years ago. Considering that the economy is far worse now than it was in 2006, the risk isn't worth it. We are just going with the flow. Phillip has to touch up the trim and I need to repaint an area over Miles' bed. When we have this joint sold, as in papers signed and closing behind us, then we will make a final decision. If that means that we have to stay at my parents house for a month, so be it. I will just be happy to have a nice big yard again. I miss my old house, though I don't miss the immediate neighbors to the right OR the neighborhood, as it has gone to pot. I just miss the ability to play out back with the girls. And they want a trampoline so much, and perhaps Santa can bring it this year if we actually have a yard to put it in. Can I just take a minute to call out the buyers for Old Navy? I went into our local store tonight. It is a nice large location that should have plenty of merch. No! It did not. They had a grand total (I counted) of 16 dresses of various styles in stock. On top of that throughout the entire women's' department, they hardly had anything in sizes beyond small and medium. Now let me tell you, this hot momma is not a small or a medium. So you know what Old Navy? You can just kiss my grits.